Celebrate contemporary digital design as it takes over the V&A for this special weekend of pop-up activities. Back for the seventh year, the Digital Design Weekend brings together artists, designers, engineers, technologists and the public to celebrate and share contemporary digital art and design. Participants take over the Museum with pop-up installations, robotics, creative electronics, talks, workshops, family-friendly events and more. The Digital Design Weekend explores human-machine interaction, making and collaborative work. 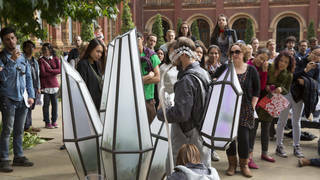 The event coincides with the London Design Festival at the V&A.